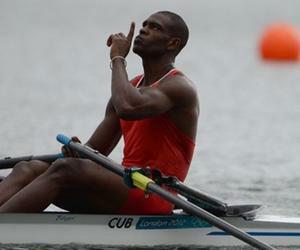 Cuban rower Angel Fournier will be present next Saturday in the final of the Men's Single Sculls event in the rowing tournament of the Rio 2016 Olympic Games. Convinced that he will win the first medal for Cuba in this sport in Olympic, Fournier got his qualification for the A final when finishing third in his semifinal heat with time of 7: 02.65 minutes. The race was won by Czech Ondrej Synek (6:58.580), escorted by Croat Damir Martin (6:59.430), who will accompany Fournier in the medals discussion. On his rivals, Fournier, multi-medalist in cups and world championships, said they are the expected, with whom he has shared podiums in top-level competitions. The other three rowers qualified for tomorrow´s final emerged from the other semifinal heat won by New Zealander Mahe Drysbale (7: 03.700), Belorussian Stanislav Shcharbachenia (7: 06.690) and Belgian Hannes Obreno (7: 06.760), in that order.